We posted the organizer's stage 17 report with the stage results. The Cóndor of Boyacá just made his legend even bigger. Five years and five days after raising his arms victorious in Annecy, while still wearing the white jersey as top under-26 competitor of the race, Nairo Quintana (Movistar Team), 28 years old, claimed honours at Wednesday’s second Pyrenees stage of the 2018 Tour de France, a short, 65km route with three big climbs – Peyragudes (Cat-1), Val Louron (Cat-1) and the Col du Portet (HC) – where the Cómbita-born rider bested all overall classification contenders. Repeating the action which took him onto success just over a month ago at the Queen stage of the Tour de Suisse in Arosa, Quintana -who had suffered a couple of mechanicals up the Peyresourde, quickly helped back to the group by Amador, Bennati and Erviti– attacked from the foot of the last ascent, continuing excellent pacing from Marc Soler to make things harder for his rivals in the GC peloton. Nairo continued to overtake riders and found vital support on his way to victory by Alejandro Valverde, part of the early break with Soler and launching the Colombian’s pace once again to leave him at the front of the race with 9km to go, with the only company of Rafal Majka (BOH). With a gap always around one minute, Quintana maintained a steady pace as well as imposing, taking the better from Majka with 6km remaining and staying thirty seconds ahead of Dan Martin (UAD), who had anticipated Nairo’s move and always was his nearest pursuit within the GC contenders. Quintana’s exploit -the Movistar Team’s 23rd victory in the 2018 season- leads the Blue rider up to 5th overall, 3’30” behind Geraint Thomas (SKY) and 59″ off Chris Froome’s (SKY) third spot. Mikel Landa -9th across the line, 7th overall at 4’34”- and Valverde -12th in the day, 11th in the standings- reinforce the Telefónica-backed squad’s team GC lead, rounding off a great performance from the Eusebio Unzué-led group before Friday’s final mountain stage over the Col du Tourmalet. 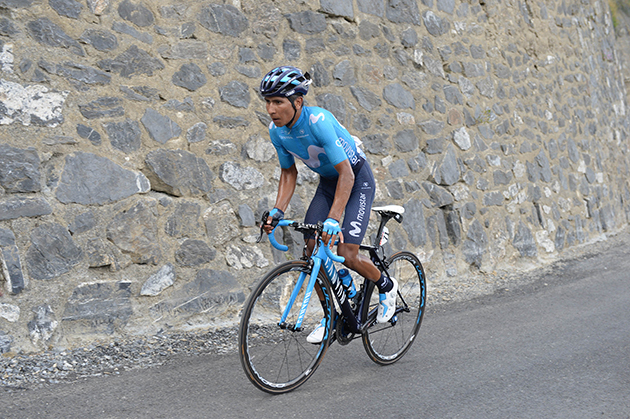 Nairo Quintana: “It was a really hard day, but a magnificent one for us, really comforting. It was a stage I had marked down many weeks before this race, one I had prepared well for. I regret so much not having found good legs prior to this stage; my body just didn’t feel right, and lost too much time, which made me feel bad. Fortunately, I’m doing well now – let’s hope we can take advantage and fight hard on Friday, because we really believe we can still do something big in this Tour. The Movistar Team always trusted my skills – and here are some results to pay them back them! “The team was perfect today. We had Alejandro up there in the breakaway, helping me out as much as he could after the attack I had launched. Also Soler, leading the peloton with a hard pace, trying to make things harder for our rivals before my move. We knew it was a finish for pure climbers, and it showed today. Thanks to the team’s work and Alejandro’s support, I could ride over the Col du Portet as if it were a mountain TT, and attack without looking back. This win gives me massive confidence for the remainder of the Tour de France. We must continue fighting and attacking – we know the GC win will be extremely hard, but we’ll try to make the race hard and see how far we can reach. Geraint Thomas put in an emphatic performance on the toughest mountain stage of the Tour de France to extend his race lead. The Welshman crossed the line in third place after a short but brutal 65-kilometre test in the Pyrenees, and now leads the race by one minute and 59 seconds with four days to go. The Col du Portet saw the overall contenders go toe to toe, with Thomas jumping on the acceleration of Tom Dumoulin (Team Sunweb) before attacking his rivals in the final metres up to Saint-Lary-Soulan. Chris Froome put in a gutsy performance to limit his losses after slipping back on the hors-categorie summit, eventually crossing the line in eighth place. The Brit now sits third overall, 2:31 back on Thomas and 32 seconds behind Dumoulin. After the stage Thomas talked through his effort on the race's final summit finish. He told Eurosport: “I was feeling really good and it was all about just defending that lead. I gained a few seconds on Dumoulin and Roglic - so a good day, I’m very happy. “At the bottom of the climb obviously Quintana and Dan Martin went really early and then when Roglic went we forced Dumoulin to ride. It was a solid place already but fortunately when it did come back together we had numbers. The boys were just incredible again, everyone was really riding out of their skin. Team Sky put in a strong performance across the entire stage, regrouping quickly following an F1-style grid start in Bagneres-de-Luchon. Luke Rowe paced the peloton over the Col de Peyresourde, and the team were strong in the face of pressure from Ag2r-La Mondiale on the Col de Val Louron-Azet. Jonathan Castroviejo and Michal Kwiatkowski combined well, while Wout Poels dragged himself back to the head of the race to set a fierce tempo on the final climb. Egan Bernal took it up, splitting the group, and ultimately helping Froome cross the line. Earlier Froome had jumped clear of the pack after following an attack from Primoz Roglic (LottoNL-Jumbo). That forced Dumoulin to hit the front, with the Dutchman eventually dragged the duo back, with Thomas able to sit on. Nairo Quintana (Movistar) launched a long-range attack on the final climb and stayed clear to win the stage by 28 seconds over Dan Martin (UAE-Team Emirates) and 47 over Thomas. UAE Team Emirates’ Dan Martin put in a thrilling performance on Stage 17 of the Tour de France to bring home another top five finish for the team – a result which sees the Irishman continue his pursuit of a top 10 General Classification (GC) finish. Martin, who held his nerve amongst the yellow jersey group for the first half of the race, decided to make his move with less than 12km to go as he pursued the breakaway riders. Showing his grit and determination, Martin continued to close the gap on the race leader and eventually secured second place just 28” behind the eventual stage winner, Nairo Quintana (Movistar Team). The race began with an unusual grid style start, similar to that in Formula One, with UAE Team Emirates’ Kristijan Durasek quickly taking his opportunity to be part of the day’s breakaway. The Croatian performed well and dropped off to make way for team mate Martin who excelled as a solo chaser of Quintana on the final and third climb of the day. Commenting on his finish, Martin said: “The last two or three days I have felt really good. It’s a really good sign. I planned to go earlier and that’s why we had Kristijan in the break. But it’s okay to say ‘attack early’, but there is so much wind on those early climbs so it wasn’t worth it. I had good legs and felt I could do a good last climb. I took advantage of the pace and they let me go and Nairo came with me, and then he attacked me and went so hard but I wanted to settle into my own tempo – it almost turned into a time trial to the top. I was trying to keep him at 10 or 15 seconds because at 500mt I could usually close that gap, but at this altitude it was tough. He was the better guy on the day, but I was really proud of how the team and I rode today”. With the result, Martin climbs up to ninth in the GC and sits 6:33” behind the leader, Geraint Thomas (Team Sky). After two hard days in the mountains, Stage 18 will give riders some respite, with just two category four climbs featuring on the 171km route from Trie-sur-Baïse to Pau. The sprinters will have an eye on this race, looking to climb the standings and get back into contention, but the peloton will have to manage the breakaway carefully to avoid any major upsets. Editors note: Peter Sagan crashed while descending the Col de Val Louron-Azet, the second of stage 17's three climbs. He finished more than 26 minutes after winner Nairo Quintana. He needs only to finish the Tour on Sunday to win his sixth Green Jersey. TEAM UPDATE Peter Sagan: After further examinations, no fractures have been reported. Peter suffers from heavy abrasions and some bruises on his right side. A final decision about taking on stage 18 tomorrow will be taken from the team tomorrow morning. Rafal Majka on the day's final ascent. 25 July, 2018, Saint-Lary-Soulan, Col du Portet (FRA): Unique, short, and tough. These were just three of the words that could be used to describe Tour de France stage 17 which saw a General Classification battle exploding the field as Tejay van Garderen rode his own race in the closing kilometers of the day to cross the line as BMC Racing Team's best-placed rider. At just 65km long, stage 17 was the shortest in recent Tour de France history, and a change to tradition meant that there was no neutralized section. Instead, the racing began immediately with the riders lined up in a grid start formation on the start line based on their ranking on the General Classification. KM 0 was at the base of the Montée de Peyragudes and with the riders also climbing the Col de Val Louron-Azet before the finish on the Col du Portet, the total amount of categorized climbing, 38.3km to be precise, made up more than half of the race. Damiano Caruso and Greg Van Avermaet, who started the day 16th and 17th overall, were in the first twenty positions when the flag dropped. However, the battle of the General Classification contenders didn't start on the first climb instead, the peloton regrouped with Team Sky setting the pace behind the initial attackers. Going over the top of the first 14.9km long climb, Tanel Kangert (Astana Pro Team) was sitting 3'30" ahead of the main bunch with various chase groups in between, the closest of which reached the KOM just 20 seconds after the lone leader. On the descent, Julian Alaphilippe (Quick-Step Floors) and Kristijan Durasek (UAE Team Emirates) were able to bridge across to the front of the race and as they reached the second category one climb, which had an average gradient of 8.3%, the peloton was splintering behind them due to a dramatic increase in pace. 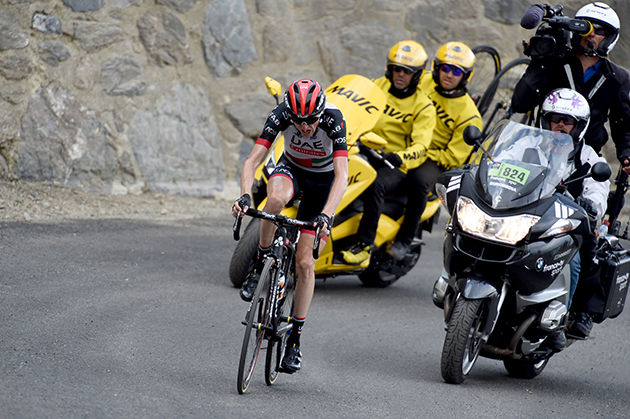 Tejay van Garderen and Caruso remained in the reduced main bunch on the early slopes of the 7.3km ascent and due to the acceleration of AG2R La Mondiale, the leaders were sitting just over two minutes ahead at the summit with five riders chasing halfway between the two groups. 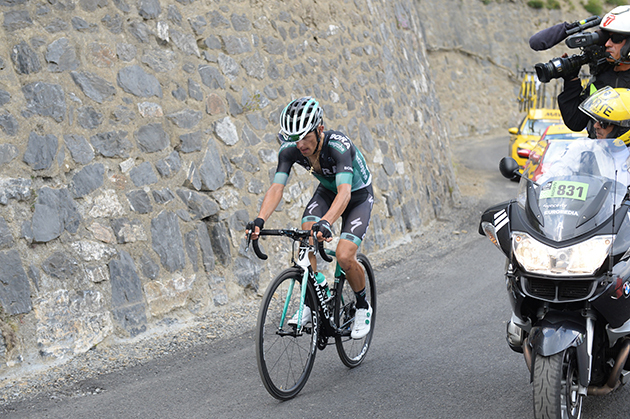 The race saved the hardest till last with a finale on the hors catégorie, Col du Portet, and in the end, it was Kangert who was once again going solo at the bottom of the 16km climb, which had an average gradient of 8.7% and pitches of over 10% in places. It was here that riders began to attack off the front of the yellow jersey group and after sticking with the first moves, van Garderen was the last BMC Racing Team rider to lose contact as the gradient and the intensity of the General Classification battle began to take their toll. With 10km to go, Kangert's advantage over the first chasers was only ten seconds and moments later, he was caught and passed by Rafal Majka (BORA-Hansgrohe) and Nairo Quintana (Movistar Team), who held on at the front of the race to take the stage win ahead of Dan Martin (UAE Team Emirates) and race leader, Geraint Thomas (Team Sky). Van Garderen continued to set his own tempo behind the leaders on the final climb and he was BMC Racing Team's first rider across the line, finishing inside the top thirty on what was, as expected, a difficult day of racing. "I don't think that the start made too much of a difference. I wasn't expecting more than just a normal format of a race. I was pretty sure that Team Sky would be able to take control and I had a feeling that the winner would come from the GC group and not the breakaway so that's why I didn't jump on the start. I wanted to try and stay with the leaders but on the last climb, when the big guys really started to move, I just didn't have the legs to follow." "On a shorter stage like today, there is less time to regroup and chill out and make a pace. This means that the speed is higher but in the end, the tactics are pretty much the same. I think the winner of the stage would have been the winner whether it was 65km like today or 165km." The upcoming week, two races in the French speaking part of Belgium are scheduled for Lotto Soudal: GP Cerami and Tour de Wallonie. The 52nd edition of the one-day race GP Cerami takes place on Thursday 26 July. The Tour de Wallonie will start two days later and is a five-day Europe Tour race in which the peloton will ride through the hilly Walloon landscape. Since 1964, the GP Cerami has been organised in honour of Pino Cerami, an Italian rider who was naturalized as Belgian in 1956 and won some Classics such as Paris-Roubaix and Flèche Wallonne. The race starts in Saint-Ghislain and will finish, after more than 200 kilometres on a hilly course, in Frameries. The riders will have to tackle some hills which were made famous by the Spring Classics, like La Houppe and the Muur van Geraardsbergen. At around 40 kilometres from the end of the race, the riders will cross the finish line for a first time. Three local laps of 13.8 kilometres will then decide who succeeds Wout van Aert as the winner of GP Cerami. The varied course of the Tour de Wallonie is suited to different kinds of riders. Sprinters, Classics riders, punchers and climbers will all have an opportunity to be victorious. The opening day of the Walloon stage race on Saturday 28 July will most likely be one for the sprinters. The following day, a hilly stage is scheduled, where the riders will climb the Citadel of Namur and finish downhill after a technical descent. The general classification will certainly be shaped during the third stage to La Roche-en-Ardenne, where the riders will have to tackle numerous climbs during the tough finale. The punchers will be excited about the penultimate stage, which finishes only a couple of kilometres after a short climb. The Tour de Wallonie ends in Waremme on Wednesday 1 August with another hilly stage. With a strong line-up including Jens Debusschere, Maxime Monfort and Tim Wellens, it seems that Lotto Soudal will be able to battle for the win in each of the five stages. Kurt Van de Wouwer, sports director at Lotto Soudal, previews the race. Jens Debusschere will be at the Tour de Wallonie. The Lotto Soudal riders are familiar with both Walloon races. In 2016, it was Jelle Wallays who took the victory in the GP Cerami after finishing solo in Frameries. Last year, Jasper De Buyst sprinted to a stage victory on the second day of the Tour de Wallonie. Line-up Lotto Soudal, GP Cerami: Jens Debusschere, Nikolas Maes, Rémy Mertz, Maxime Monfort, Tosh Van der Sande, Jelle Wallays and Enzo Wouters. Line-up Lotto Soudal, Tour de Wallonie: Jens Debusschere, Frederik Frison, Maxime Monfort, Tosh Van der Sande, Jelle Wallays, Tim Wellens and Enzo Wouters. Sports directors: Kurt Van de Wouwer and Marc Wauters.